Leila Nadir is an Afghan-American artist, critic, scholar and memoirist. In this interview conducted by Zohra Saed, Nadir discusses growing up mixed race, identity after 9/11, as well as her art and latest projects. Leila Nadir is an Afghan-American artist, critic, scholar, memoirist, and co-founder of the art/theory ecoarttech collaborative, which recently completed a commission for the Whitney Museum of American Art. She earned her PhD in literature from Columbia University in 2009 and was Mellon Foundation Post-Doctoral Fellow at Wellesley College in 2010-2011. 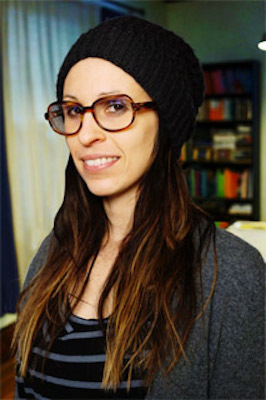 In addition to publishing scholarly articles in peer-reviewed journals about art, literature, new media culture, and the environment (Leonardo, Antennae, Cather Studies, and Utopian Studies), she is a regular contributor to Hyperallergic and has published (or has forthcoming) reviews with American Scientist, Rhizome, and Furtherfield. Her work has received many awards, including numerous university fellowships as well as grants from the Andrew Mellon Foundation, New York Foundation for the Arts, New York Council on the Arts, as well as the Eugenio Battisti Award and the Arthur O. Lewis Award from the Society of Utopian Studies for her original research into the role of utopian thinking in environmental thought. 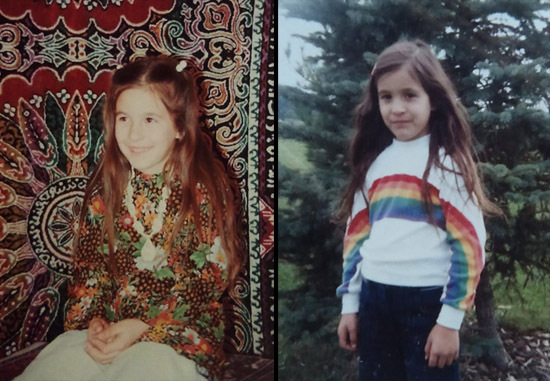 Excerpts from her childhood memoir-in-progress about her parents’ colorful Afghan-American marriage have been published or are forthcoming in North American Review and The Asian American Literary Review. For the special Critical Mixed Race issue of AALR, she edited with Zohra Saed a series of interviews of Afghan-American artists and writers. Leila teaches humanities courses in the Sustainability and Digital Media Studies programs of the University of Rochester. Zohra Saed: What was your childhood like growing up mixed race? What were the challenges and the blessings? Leila Nadir: I’m actually still trying to figure out what happened during my childhood. In one of my earliest memories, I’m standing in a shopping mall, in front of one of those decorative fountains, the kind that fill the atriums with a magical ssshhh sound. I’m clenching a penny in my fist and concentrating as hard as I can, praying to Jesus or Allah. (I had a practice of trying one, then the other, going back and forth, trying to better my odds of being heard by trading out my parents’ different Gods.) I make a wish, throw my coin into the water, and watch it fall to the bottom of the pool with all the other coins. I wished for my Afghan father and American mother to get divorced. My parents met at a New York State college in the early seventies. My father was an international student from Kabul, Afghanistan. My mother was an undergrad from Binghamton, and the grandchild of early-twentieth-century Catholic immigrants from what would become Czechoslovakia. I have yet to meet more eccentric characters. They may in fact be two of the most dysfunctional people I have ever known, and their personalities and problems, of course, defined my childhood. When they weren’t giving each other the silent treatment, they fought. For some reason, a separation was out of the question, and so the negative feelings they had for one another pervaded my childhood home. It was traumatizing for a child in many ways, but as an adult, I find their relationship almost comical. “Before” photo: Leila Nadir, circa 1982/1983, before her American haircut. See her short story, “Chadars and Hairspray for our Muslim Daughter,” in AALR’s Hybrid Mixed Race print issue for more details about her childhood bicultural hair. For example: our home was bilingual, which people usually assume is a blessing, a sign of a childhood rich in diversity. However, though she had perfect comprehension, my mom refused to speak Persian: she said my father once made fun of her accent and as retribution she never uttered another word in his native tongue. And my father refused to speak English: he claimed this was the only way to make his children truly fluent in his language. And so it was impossible to have a family conversation. If I spoke English, Baba pretended not to hear, and if I spoke Persian, mom would not speak. Pork was also source of tension—even fake pork. After a decade of enjoying the turkey sausage that my mother fried up with eggs for our Sunday breakfasts, my father one day declared that it was un-Muslim to eat anything designed to taste like pigs and tossed the meat in the trash. He had no idea that my mother hid a stash of real bacon in the back of the freezer, and she’d fry it up when he wasn’t around, encourage her Muslim kids to eat it, and then exhaust the smell out of the kitchen with a fan. Needless to say, I’ve never been able to relate to all our popular culture’s romanticizing of bicultural childhoods. It’s not that I think a monocultural background is better; it’s just that mixed-race families can have all the same problems as any other family. Many years ago I read a history of the Beats—I can’t remember the title—that surmised that Allen Ginsberg might have kept hanging around a jerk like Jack Kerouac because Ginsberg’s mother was mentally ill and as a result he had a “high tolerance for insanity.” I’ve carried that phrase with me ever since. I don’t know what parts of my childhood were Afghan, which were American, and which parts were particular to my strange mother and father or particular to their family histories. But I do know that through their parenting I developed an ability to not be shocked by much, culturally or psychologically. I was pretty much born into this world with every sentimental cliché already blown out of the water, and as a writer and an experimental artist, I consider this a gift. ZS: How did your identity and sense of where you fit change after 9/11? LN: I’ve always been attracted to the words of Tamim Ansary, who I interviewed for this special issue of AALR, about not having a choice about his identity after 9/11. When I left home for college in 1993, I left my Afghan identity behind. I distanced myself from my parents, and generally from my extended family too since my experience of biological family was never that comfortable. I believe I inherited a strong, outgoing personality from my father’s Afghanness, a desire to be interactive and welcoming, and I found my mother’s Slovak-Catholic family members to be insular, incommunicative, and too repressed. However, I also absorbed a self-reliant individualism from American culture—Thoreau has always been an inspiration for me—so the conformist pressures of Afghan family life could be stifling. So I sort of struck out on my own and didn’t look back. Plus I didn’t feel truly Afghan because I had come from such an unsettled, confusing home, making me think that my claim was inauthentic. Wasn’t I supposed to feel at home with being Afghan-ish? While I was off backpacking in the Adirondacks and on the Appalachian Trail, hanging out in the wilderness, I didn’t think I seemed much like the Afghans I knew. 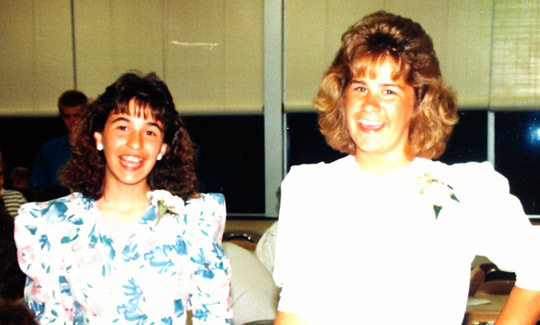 “After” photo: Leila Nadir, 1989, after her American haircut and perms, with friend Laura, at eighth grade graduation. See her short story, “Chadars and Hairspray for our Muslim Daughter,” in AALR’s Hybrid Mixed Race print issue for more details about her childhood bicultural hair. When 9/11 happened, I suddenly found myself defending Afghanistan, its people, and its diaspora from so many forms of demonization. I realized that I knew much more than I’d thought, that I was more Afghan than I’d believed. I realized I had a faithfulness to Afghanistan, and I became more comfortable with the idea that I had a fragmented Afghan identity but an Afghan identity nonetheless. At the same time, I began treating Afghanistan and being Afghan as a place to put my intellectual and creative energy. I was in NYC at the time, getting my PhD in English at Columbia University, and I began taking Persian classes and studying Persian literature and film. Another outcome of 9/11 is that I began to seek out Afghan-American colleagues, writers, and artists, building up a new kind of bicultural network that I find more fulfilling than relying only on family ties. ZS: Can you tell me how your art has grown, changed and transformed itself in these years of weaving an Afghan American life? And what is your latest project? LN: I work as a critic, essayist, artist, professor, and creative writer. My Afghan-Americanness has always exerted its influence on my projects, but until recently this influence was indirect, in many ways unconscious. My doctoral dissertation was a deconstruction of environmental sacrifice narratives (consume less, go back to the land, give up material benefits, etc.) in twentieth-century North and South American literature. I felt odd that after many years of studying Persian literature at Columbia, I had ended up with a manuscript on such a quintessential American topic, stemming back to nineteenth-century U.S. Romanticism. It was a critique, but it was an affectionate critique. At my defense meeting, one of the members of my committee, a Spanish-language literary scholar at Rutgers, commented leadingly that the dissertation felt like it was written by a non-American, that it was coming from somewhere else. He had no knowledge of my ethnicity but he felt it. My cultural displacement came through. The creative projects I undertake with artist Cary Peppermint, my collaborator and partner, also examine questions of environment. (We work together under the title EcoArtTech.) I think this ecological consciousness, which unites so much of my work, has its origins in the shifting environmental terrain of my Afghan-American childhood. I grew up in a small one-light town in western New York State, a real pastoral scene with cornfields and dairy cows, and country roads that wound through endless woods—a beautiful landscape but one that was culturally homogenous and almost exclusively white. And yet my everyday life was struck through with issues of globalization, the Cold War, mobility, and international relations because of my extended Afghan family and network of friends. On weekends, I attended the new mosque in Rochester, amidst a Muslim immigrant community of Pakistanis, Egyptians, Iranians, and others, and attended Afghan parties in cities across the state, like Oswego, Buffalo, and Syracuse. My mixed-ethnic experiences of the local and the global, I think, developed into my continual intrigue with questions of mobility, place, and ecological identity—even if the ethnic remained beneath the surface of the environmental. Now I am working on a book-length memoir in which ethnic issues have finally come to the fore, and the environmental thread has moved toward the background. The memoir is titled Cold War, and it follows the war in Afghanistan alongside my parents’ conflicts, tracing how the local, the global, and the domestic shaped my life as a Muslim Afghan-American girl in pastoral, small-town U.S.A. At the same time, though, it’s also a story about an unhappy marriage between two tortured souls, told from the perspective of one of their seven children who is gathering old memories in order to figure them out. One chapter from Cold War was included in the print edition of AALR’s Critical Mixed Race special issue. It’s a story about how my hair and my parents’ hopes and dreams about how I would style it. This entry was posted in Interviews, Mixed Race Initiative and tagged afghan-american, interview, leila nadir, zohra saed. Bookmark the permalink.